Please Note: Some Special Events are open to the public and charges vary. Net proceeds from these Special Events benefit the Sustaining the Mind (STM and Scholarship ) campaigns. DESCRIPTION: Meet TIFFANY KUNZ AND DESIREE KESSEL OF LA ECO CONSCIOUS JEWELRY BRAND. Learn how to change your look by changing your jewelry. Arrive at 1 PM wearing your favorite outfit and Tiffany and Desiree will help you choose various pieces of jewelry at prices that will meet all budgets. As they talk about “changing your look,” you will learn about a company that believes in philanthropy and works to empower impoverished women worldwide. Join us for a fun afternoon of shopping. Gourmet snacks are included. 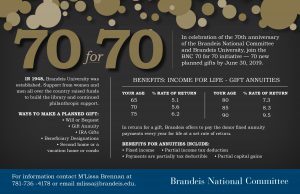 Treat yourself or a loved one to a holiday gift while supporting Brandeis University. 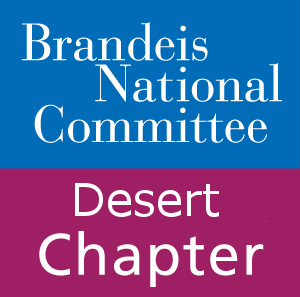 COST : No charge to you, but a 25% donation will be made to Brandeis University for all sales. Please sign up in advance to save YOUR PLACE. DESCRIPTION: This exciting film, produced by Nancy Spielberg, recounts the story of Jewish American pilots, who, beginning in 1948 secretly fought for the independence of Israel. The movie will be followed by a guest speaker and home-baked desserts. COST: $20 per member; $35 for couples; $25 per guest. DESCRIPTION: Join Patrick Blythe, renowned glass artist, in his studio to create your own unique work of glass art. DESCRIPTION: Join us for a movie (TBD) from Brandeis archives. Home baked sweets will be served. WHERE: PALM SPRINGS ART MUSEUM, 101 MUSEUM DR. PALM SPRINGS, CA. AT 9:45 SHARP. The group will meet Steve, the guide, in the museum’s north parking lot (the one on the right when facing the museum). We will meet at the Buddy Rogers box at the Annenberg Theater and be transported up the driveway by golf cart. DESCRIPTION: Join us for a 2 hour guided tour of the grounds and interior of this meticulously restored 1920’s historic home on the National Registry of Historic Homes. The views overlooking the Valley are spectacular. The home has lush flower gardens, graceful stone arches, and lovely secluded courtyards. It is often chosen by the Coachella Valley Water Color Society for Plein Air painting sessions. WHERE: Home of Cathy Rogers, Mission Hills. Address will be sent to participants. DESCRIPTION: Cathy Rogers, whose passions are cooking and philanthropy, will offer a delicious gastronomic and tasting experience to 20 participants in her lovely home. COST: $100 Separate check made out to Brandeis University(100% deductible).